UK - The much-loved Ant and Dec’s Saturday Night Takeaway returned to UK screens on Saturday February 22 with the promise of a daring and dangerous head to head challenge for the stars of the show. Entitled Men on a Ledge, the terrified twosome (one of whom has a real fear of heights), were escorted outside onto the ITV studio roof and prepared to take part in a race from the top of the 90m high ITV tower down to the ground. 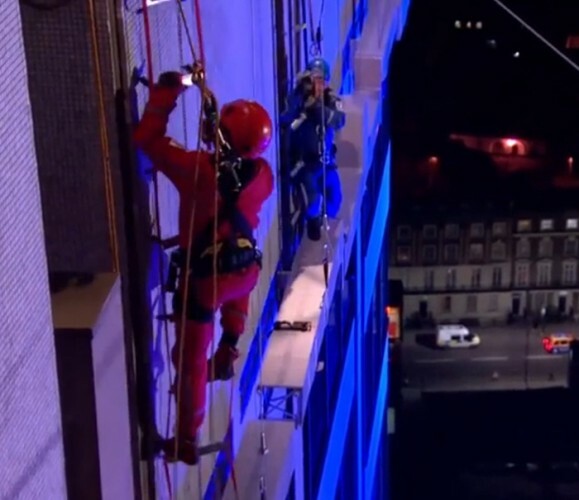 The stunt was planned and executed by Unusual Rigging’s technical director Robin Elias, who explained: "Men on a Ledge is the latest in a list of Ant and Dec challenges we’ve worked on. We were presented with a ‘wish list’ by the show’s producer about five weeks ago, outlining his vision for the challenge. It was our job to find a solution and design the systems to enable it to happen." From the beginning of the project, Robin knew there would be challenges not just for Ant and Dec, but for the Unusual team as well. "One of the conditions of the project was that we were not allowed to fix to the building and so had to design a system of structures with cantilevers and water ballasts which could be taken to the roof (in a very small lift) from which we could hang the ledges. The ledges were constructed of truss, clad to look like concrete." 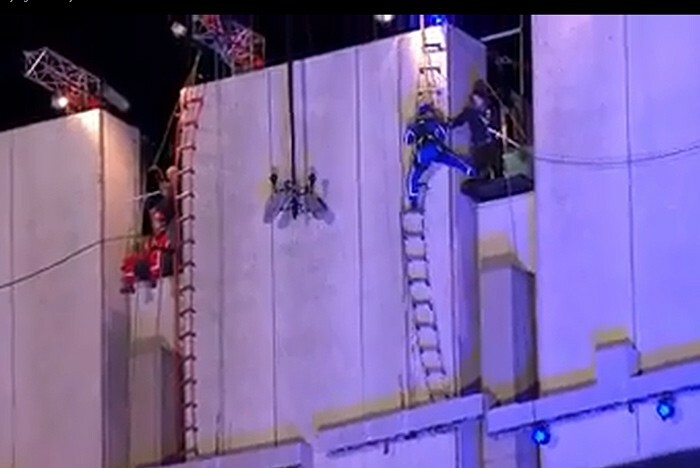 The challenge involved Ant and Dec climbing 5m down a rope ladder, then making their way along a 300mm wide ledge, which narrowed down to just 200mm. They then climbed back up another 5m rope ladder and finally descended down 200m long zip lines to a nearby car park. Another issue that had to be factored into the planning of this challenge was the wet and wild storms which have battered the UK in recent weeks, but Unusual Rigging is well versed with the saying "the show must go on" – whatever the weather. With all the structures in place for the challenge, it was then time for fine tuning and rehearsals. Alterations were being made right up to the eleventh hour, as the producers continued to have ideas of how to make the challenge look even more scary and treacherous and of course, everything was rigorously tested before the stars of the show place their lives in Unusual’s hands. However, Robin added: "They’re not actually risking their lives at all, of course, but it’s essential that the home and studio audience genuinely believe that Ant and Dec are facing danger. We strive to ensure 100% safety first and foremost and then get our creative caps on to figure out how to make it look like a death defying stunt." Of course it wouldn’t look like a dare-devil stunt if Ant and Dec appeared calm and relaxed at the end of the challenge, and their reaction on Saturday night didn’t disappoint. Looking visibly startled, Ant said: "I can’t believe I just did that. It was horrendous!" Dec added that it was definitely "The worst we’ve done" and that reaction, says Robin "proves we’ve done our job well and fulfilled our Saturday Night Takeaway challenge yet again".